E3 2016: Microsoft launches Xbox One S with 4K UHD support and new Xbox Wireless Controller. 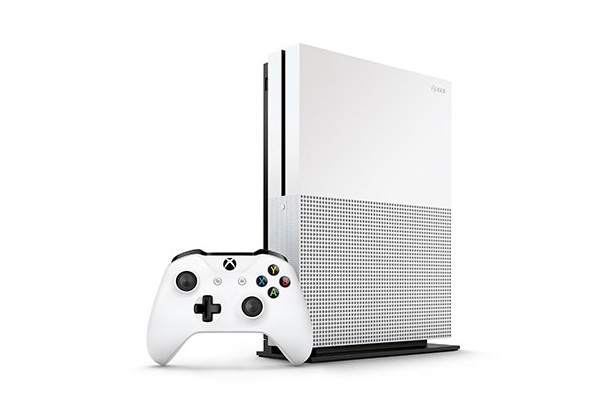 Today at E3, Microsoft added a new member to the Xbox One family, the Xbox One S. With a fresh new design and "robot white" color, the Xbox One S is 40 percent smaller than the original Xbox One, starts at $299 USD. It also includes a built-in power supply, and in response to fan requests worldwide, can be placed horizontally or vertically with an optional stand. Xbox One S is not just slimmer and sleeker. You'll now be able to watch Blu-ray movies and stream video in stunning 4K Ultra HD video, with content from partners like Netflix and Amazon Video. Xbox One S also offers High Dynamic Range (HDR) support for video and gaming, so you can experience richer, more luminous colors in games like Gears of War 4 and Scalebound. With a higher contrast ratio between lights and darks, HDR brings out the true visual depth of your games and media. For increased accessibility, Microsoft shifted one of the three USB ports and the pairing button to the front of the Xbox One S alongside the newly added IR blaster. Additionally, in order to make the Xbox One S as compact as possible and make all of these updates, Microsoft removed the dedicated Kinect port from the back. Kinect for Xbox One will still be compatible with Xbox One S via the Xbox Kinect Adapter for USB connection and offers the same great experiences as the current console. For fans that currently own a Kinect for Xbox One and plan to purchase the Xbox One S, Microsoft is offering a free Xbox Kinect Adapter. Visit xbox.com/XboxOne/KinectAdapter for more details. The Xbox One S comes with a newly designed Xbox Wireless Controller featuring textured grip for enhanced comfort. Microsoft improved the Xbox Wireless signal performance to give a more reliable wireless connection to the console and up to twice the wireless range when used with Xbox One S. To enable easier wireless connection to your Windows 10 devices, Microsoft also added Bluetooth support (Bluetooth capabilities require Windows 10 devices running the Windows Anniversary Update). The new thumbstick design significantly reduces wear to help maintain accuracy and smooth rotation over the life of the controller, so you never miss a beat. The new Xbox Wireless Controller is included with all Xbox One S consoles and will be available worldwide for individual purchase for $59.99 USD. All Xbox One games, accessories and Xbox Live services will work with the new Xbox One S. With 500GB, 1TB and special launch edition 2TB options, you can choose the hard drive that's right for you. The limited quantity 2TB launch edition Xbox One S will be available in select markets starting early August for $399 USD, with the 1TB Xbox One S for $349 USD and the 500GB Xbox One S for $299 USD arriving thereafter. The Xbox One Vertical Stand will also be available for standalone purchase for $19.99 USD.